There are at least 10,000 Palestinians in 'Israeli' gaols. Some have never been charged and there are many political prisoners. Children in the internment camp which is Gaza cannot see and hug their Dads. VOICE OF PALESTINE GAZA, (PIC)-- Hundreds of children in Gaza Strip have gathered Thursday at Gaza Sea to send a letter of love to their fathers who are incarcerated in Israeli jails for years now, alarming the entire world that they also have the right to live in peace with their fathers like all children of the world. 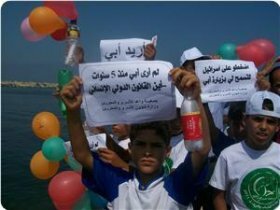 The activity that was organized by the Waed Society for prisoners and ex-prisoners was attended by officials of the ministry of prisoners and ex-prisoners in Gaza and a delegation from the international solidarity committee where the children wrote message to their detained fathers and put them in bottles and flew them with balloons in hope it could reach the detention cells of their fathers. The children agreed to write one common message translated to English and read:" The summer comes after summer and all children go to the beach to play with their fathers but we are not. The feast comes after feast while we wait for every new dawn to come in the hope that our fathers could be released and join us… we don’t know up to when shall we bear this suffering, and till when shall we live in pain and dismay???. We feel the pain in our small hearts as we hear the entire world talk about [Gilad] Shalit but forget our fathers!! Doesn’t the world know that Shalit has no children to miss him but our fathers have and we indeed missed them? All what we know that we have fathers behind bars there in Israeli jails; we haven’t seen them and perhaps we couldn’t recognize them after this long period of time in which we were denied visits to our fathers. Oh you who claim to be human rights czars, do you accept this fact? Or perhaps you think that Palestinian children have no human rights?! Hence, we are here today to tell the entire world and the international conscience that we need our fathers with us free. We need to talk to them, to live with them, and to play with them. Where are the foundations of the child's rights? Where is the UNICIF that has never talked about our agony? Don’t they feel what we feel? We call on all the free people of the world to help us free our fathers and to have them with us because we need to touch them and we need to hug them also … we indeed want to live our life as the children of the world do".